Students taking courses in JMP 3201 this semester will be treated to a newly renovated state-of–the–art Distance Education technology classroom. DETS began the renovations over the winter 2010 break, adding the Clark School's first high definition wide screen displays to the room. 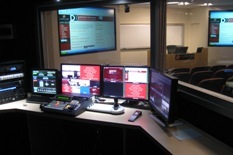 A fully outfitted television control room, cameras, sound system, and furnishings were completed over the summer 2010 break. Designed to be used for both distance education and regular classes, the room features a large professor workstation complete with touch screen control system, computer, laptop inputs, wireless microphone, and an annotation tablet. The annotation tablet, a feature not normally found in technology classrooms, allows the professor to “draw” over the computer image while it is shown on each wide screen display. When used for distance education courses, a technician located in the adjacent control room, controls video cameras, Rich Media capturing equipment, and video conferencing equipment used to facilitate the course. In addition to the technology features the room provides, students enjoy the theater style seating complete with fold down writing surfaces and electrical outlets at each chair. Professor response to the new room amenities has also been very positive. When recently asked, Dr Dave Lovell, Associate Professor in the Department of Civil and Environmental Engineering, told DETS "I enjoyed teaching in the room because the installed technology was useful and user-friendly, allowing me to deliver interactive lectures that the students enjoyed." I enjoyed teaching in the room because the installed technology was useful and user-friendly, allowing me to deliver interactive lectures that the students enjoyed.